I have a confession: when song-festival chair Marisa Gudrā first mentioned hosting dziesmu svētki, I had zero interest. Then she told me that Krisīte Skare was already on board as music director. Suddenly, I was interested. I knew Skare from our time together at Gaŗezers Latvian summer high school, where she was not only my class’s valedictorian, but also a musical prodigy who I made a point of standing next to during choir rehearsals so I could try (unsuccessfully) to copy her perfect pitch. It didn’t surprise me that Skare went on to earn three degrees in music, including a master’s degree in jazz performance from the prestigious New England Conservatory of Music and a master’s in education with a focus on the arts from Harvard University, and to establish a musical professional career as an educator, performer, music director, and choir leader. 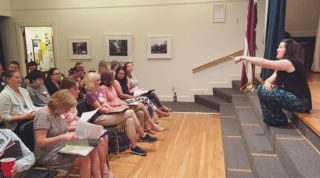 For the past ten years, Skare has also applied these skills to teaching Latvians, from the children of Katskiļi summer camp and Boston’s Latvian school to the adults of Boston’s choirs. And Skare brings more than music education to the Latvian community: she was the principal of Boston’s Latvian school for six years and is the current church treasurer. In recognition of all these contributions to the Latvian music and education scenes, Skare has earned commendations from the Latvian Heritage Foundation, the American Latvian Association, and Latvia’s Ministry of Education. Once it became clear that the festival would indeed be going ahead, and after Skare had a chance to meet with other festival leaders, she got to work assembling a crack team. She turned to Latvian friends with impressive musical pedigrees and was happy when every one responded positively. Laura Padega Zamura, the head of New York’s Latvian choir, had collaborated with Skare at Katskiļi summer camp and would play a major role in preparations for the Festival Choir Concert. Dace Aperāne, a composer and recent recipient of Latvia’s prestigious Grand Music Award for popularizing Latvian music abroad, is, in Skare’s words, “a treasure trove of knowledge for basically any musical subject matter.” Agita Arista is a professional flautist from Latvia now living in Boston who has become invaluable in working with the festival’s instrumentalists. And Iveta Grava, a former member of famed Latvian choir Ave Sol as well as a member of the festival organizing committee in D.C., pulls double duty, helping with administrative tasks on the music committee. With two organizers in Boston, two in New York, and one in D.C., the music committee exemplifies the collaborative nature of this East Coast project. It’s further supported by superstar shadow helpers like Juris Ķeniņš, a repeat organizer of Canada’s Latvian song festivals who is always ready to lend expertise and input, and Skare’s mother, Ilze, who has taken on some of the committee’s more thankless tasks — such as hand-numbering hundreds of songbooks after they arrived with a printer error. With the team assembled, the most pressing matter for Skare was selecting the repertoire and preparing materials for the festival’s main event, the Kopkora koncerts (Festival Choir Concert). Skare started by entering every song from every previous festival into a spreadsheet and conducting a detailed analysis, from which she learned that, with a few exceptions, there is surprisingly little repetition or tradition where song selection is concerned. From there, the team’s members each compiled a dream list and started whittling. They began by keeping some lyrical folk favorites and newer, upbeat rhythmic pieces that complemented Skare’s effervescent musical personality, then decided to highlight a selection of East Coast composers. Each composer was asked to decide which of their songs they would like to see performed. By the summer of 2016 the repertoire had been selected. Now came the hard part: finding and arranging all of the sheet music for each piece (while not infringing on copyrights). Thankfully, the music program has a guardian angel: Musica Baltica, a publishing house in Latvia whose leader just happens to be a friend of Aperāne. For a truly nominal licensing fee, Musica Baltica sent Skare the majority of the necessary sheet music, leaving her to write the remaining music out by hand. In September, the sheet-music songbook went to the printer, and soon thereafter distribution to choirs began, providing Skare her first solid look at the number and size of choirs participating. It turns out that this process is still continuing; several groups have signed up as recently as a couple weeks ago. Skare explains that it is often difficult to pin down exact participant numbers, since choirs can afford to be more flexible than dance troupes can. Still, the current estimate, based largely on the number of songbooks sent out, rests at roughly 500 singers from across the U.S., Canada, Latvia, and Ireland. Conductor selection happened around this time as well. Part of the search focused on traditionally underrepresented demographics: East Coast icons (this will be the first Latvian American song festival on the East Coast in over three decades), experienced conductors who have never graced the kopkoris conductor’s podium, and female talent. Including women is particularly important to Skare, who remembers thinking, “I want to be her when I grow up!” when Toronto’s Vizma Maksiņa conducted at the Cleveland song festival twenty years ago. Skare went on to discover that women are tremendously underrepresented in the conducting world; Baltimore’s own symphony orchestra is the only major city orchestra in the country with a female music director — Marin Alsop. Instrumentalist selection worked very differently, with the music team listing and contacting all professional Latvian instrumentalists they could think of who are skilled enough to play together after just one rehearsal. Invitations went out to everyone, and of the lengthy list, twenty-seven people accepted and will be performing in Baltimore. This means that all of the festival’s instrumentalists will be Latvians or have Latvian connections, whereas other festivals on occasion have had to hire local non-Latvians to fill the gaps. This musical bunch is a perfect example of how far-reaching song festivals can be, drawing participants from Minnesota, Massachusetts, New York, New Jersey, Michigan, Pennsylvania, Florida, Canada, and Latvia. The majority of these instrumentalists will be pulling double or triple duty. Almost all will be accompanying the choir during the Festival Choir Concert, most will perform at the Latvian Chamber Music Concert, and some will participate in the Sacred Music Concert. While the Festival Choir Concert is the grand cornerstone of every dziesmu svētki, attracting not only the largest audience but also the largest chunk of Skare’s time, the two smaller concerts are also definitely not to be missed, as the committee has dedicated itself to make them spectacular for all festival attendees. The task of assembling the program for the Chamber Music Concert falls mostly to Arista. She, Skare, and the rest of the committee are acutely aware that chamber music has a reputation as being stuffy and stodgy. “People our age either are or are not in that world, and have their biases,” explains Skare. But the goal of Baltimore’s chamber music concert, she says, is to “be interesting for people who don’t think they like classical music.” Helping this effort is the concert’s unique venue: the American Visionary Art Museum, a whiskey warehouse turned hip alternative-art gallery that exudes fun and vibrance. An emcee will be on hand to explain what is happening in each piece. “Learning about the music gets you more invested in it,” explains Skare. And the concert’s programmers are striving to choose an engaging repertoire that will make a connection with the audience. This connection will also be on hand at the Sacred Music Concert, where audience members sitting in the astoundingly beautiful sanctuary of Christ Lutheran Church will literally be surrounded by the show. Musicians will place themselves in different locations around the chamber, depending on acoustics and the needs of each particular piece. Skare envisions the experience as a soothing meditation, enveloping listeners in ethereal melodies. Adding its talents will be the festival’s award-winning guest choir, Sōla, which is collaborating with Skare’s team on the project. What remains to be done over the remaining few months? Skare is currently working on the Opening Ceremony with Anita Juberts, the Very Rev. Anita Vārsberga-Pāža, and festival folk-dancing director Astrīda Liziņš. The ceremony will welcome festivalgoers back to the East Coast with a mini-concert from various East Coast choirs and dance troupes. Also in the works or coming up soon: sheet music needs to be assembled and delivered to the instrumentalists for all shows, and the program for the Sacred Music Concert must be fully worked out with Sōla. Once those tasks are completed over the coming weeks, Skare’s focus will return to the Festival Choir Concert, for which the largest remaining task is figuring out gametime logistics: how to best divide up rehearsal times, how to maneuver several hundred people onstage and backstage, etc. Any advice for future festival leaders? “If you have a vision for the kind of experience that you want the Dziesmu Svētki public to have,” says Skare, “really stick with it and don’t waver. I think that’s what’s made a lot of my decision-making easy: I return to the big picture. That way you can remove yourself from nitty-gritty questions and then those become easier to answer.” Skare’s vision for Dziesmu Svētki is clear. “I as a musician have been to really boring concerts. How do we make this engaging and a little bit fresh and different?” Audiences will discover the answer this summer in Baltimore.